Late summer and early autumn is an ideal time to look out for these oceanic birds in the sea around Arran. 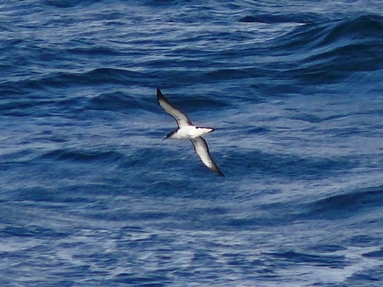 Manx Shearwaters have long straight slim wings, black above and white below. They fly with a series of rapid stiff-winged flaps followed by long glides on stiff straight wings over the surface of the sea, occasionally banking or 'shearing'. Their food includes small squid, small fish and free swimming crustaceans. Manx Shearwaters only come ashore to breed and Scotland holds about 34% of the world population. The largest breeding colony in the world is on Rum with most nesting on four mountain tops in burrows and under boulder scree between 450 and 700m. Viking names for these peaks such as Trollaval suggest at least a millennium of occupation. The blood curdling screams from the colony were probably responsible for stories of the "trolls". Closer to Arran there is a breeding colony on Sanda and another on Copeland Island off Northern Ireland. 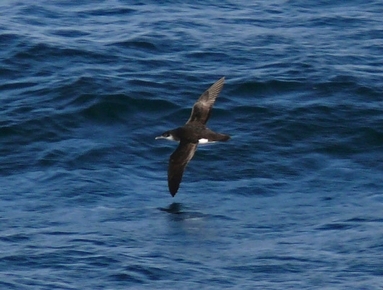 One Manx Shearwater was found dead by a burrow on Pladda in 1979. Breeding birds return from their oceanic wintering grounds off South America in late March. Laying commences in May. Chicks fledge after about seventy days and head south usually in September. Chicks ringed in Scotland have been recovered as far away as Brazil and southern Argentina. They are long lived birds in some cases attaining an age of over fifty years.